Staplehurst to Headcorn - An anemone lovers delight. An easy walk through fields in the Kentish Weald and an option to visit Sissinghurst Gardens (NT). Tickets : Buy a Day Return to Staplehurst for option c) or Headcorn if you intend to end your walk there. If you're not worn out from the great selection of walks over Easter, here's an easy stroll for you to consider. I've had some valuable input from Walker on this trek and on his advice I suggest option c) of the walk. This option ends in Cranbrook where there are fairly regular buses to Staplehurst. These buses also serve Sissinghurst village (not the NT site but the village a mile and a half away), if any want to linger and look around the gardens at the NT property. (There is a nice pub in that village too.) The walk into Cranbrook follows a nice ridge with pleasant views, and the town is worth seeing. The Bell & Jorrocks, Frittenden, t: 01580 852415 - The history of the pub may be found here. The Village Tea Rooms, Headcorn t: 01622 890682 - shuts 4:45 pm. Trains return from Staplehurst to London Charing Cross at 23 and 53 minutes past the hour. 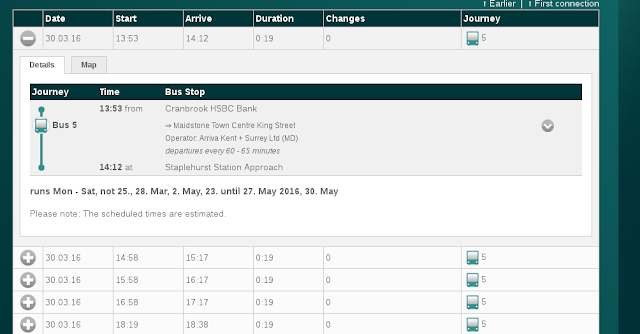 The buses take 20 minutes, so those leaving at 58 past get to Staplehurst at 17 past, all being well, and then connect with the 23 past train to Charing Cross. If the bus is late, one would be stuck with the next train, the 53 past. The 18.19 connects with the 18.53 train quite comfortably. Another excellent mid-week turnout for this pleasant outing in the Low Weald of Kent. The start was not auspicious as we had to traverse several very muddy or soggy fields but the terrain became a bit firmer as we approached the lunch pub in Frittenden - the Bell and Jorrocks. We never did find out what a "jorrocks" is or was but no matter, the pub coped admirably with the 14 who sat down to eat - and how wonderful to enjoy a pint of Harvey's Sussex after the Lentern abstinence. After lunch the group split into Headcorn finishers and Cranbrook finishers - and I was with 6 doing the latter. I'm not sure if the Headcorners visited Sissinghurst but if they by-passed it they missed a treat - the gardens were lovely. Then it was onwards to Cranbrook, a quaint town with some interesting buildings, a quick cuppa or takeaway drink for some as we dodged a later afternoon shower, and then the bus which whisked us back to Staplehurst for the connecting train back to London. An easy day's walking with some early signs of Spring proper - a few wood anemones (late this year?) and some bluebells which (foolishly ?) were making an early appearance. Do this walk in three week's time and the woodland flowers should be quite stunning.